Disability Employment Awareness Month has been celebrated in Texas each October since 1999. The Texas Governor’s Committee on People with Disabilities produces a colorful poster for display in businesses, government offices and schools. The posters are intended to spark a conversation about employment of people with disabilities. Artwork for the poster is selected by a submission and judging process and is open to any Texas artist with a disability. Ashley Sattler, from Beaumont, is this year’s poster competition winner. The colored pencil drawing is featured into the design of the poster. 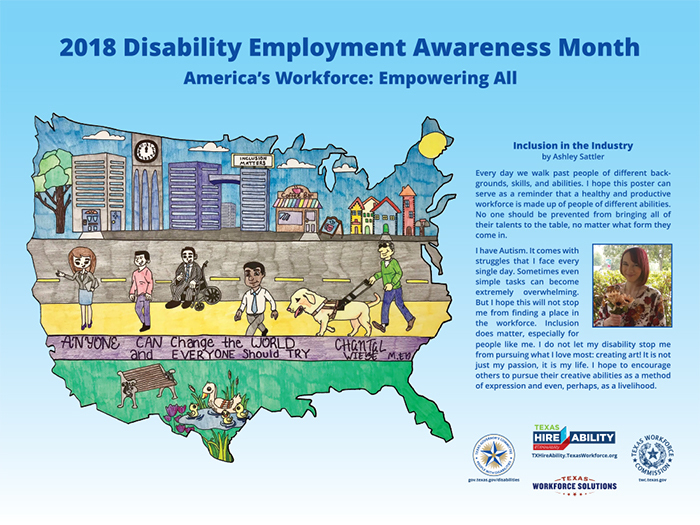 Ashley’s artwork embodies the national theme for Disability Employment Awareness Month, AMERICA’S WORKFORCE: EMPOWERING ALL. As part of our state’s recognition of Texas Disability Employment Awareness Month, the GCPD promotes the Texas HireAbility Campaign. Texas HireAbility is a partnership between the Texas Workforce Commission, the Texas Governor’s Committee on People with Disabilities and the statewide Workforce Solutions network. HireAbility hopes to raise awareness about the benefits of hiring people with disabilities and highlight the contributions of people with disabilities in the workforce. Each poster includes the twitter hashtag (#TXHireAbility). Resources to promote disability employment awareness activities can be found at txhireability.texasworkforce.org. If you would like to request a poster, please send us a message and provide your name and U.S.P.S. mailing address to obtain a print. The posters are permanently displayed alongside the original artwork at the offices of the Texas Governor’s Committee on People with Disabilities. In support of the What Can YOU Do? outreach effort, the Campaign for Disability Employment is pleased to present the following video tools. Help us spread the word about the value and talent that people with disabilities bring to the workplace by sharing these videos and playing the Campaign for Disability Employment’s “I Can” public service announcement (PSA).